I'm also playing at Simon Says Wednesday Challenge, where the theme is clean and simple. Your loping bird makes me smile and doesn't give me 'bird terror' in the least! The water-coloured sky, polka dot grass and trio of blooms make for a most charming scene! Delightful - and so thrilled you played along at TIME OUT! This totally makes me smile, Shirley... Great to see you playing along at TIME OUT! I love the artsy sky and the fun, textured grass... And who can resist this bird. Such fun card with great details! Adorable card! Such a fun CAS design!! So sweet! That bird image is so kooky, I love it!! And that embossed hill is such a cool idea, would never have thought of doing that. 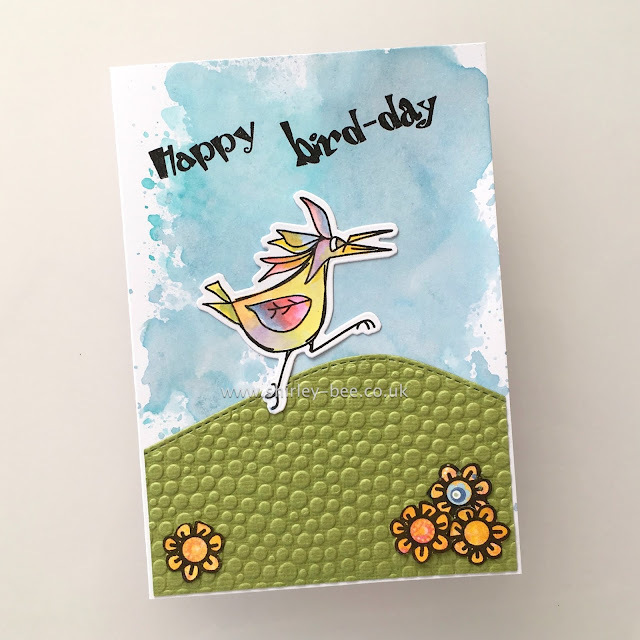 Its a fabulous card, so perfect for the challenge, so glad you shared it with us at TIME OUT! !